These open hoops are made with a choice of standard post size of 20ga or a thicker 18ga wire for those with larger piercing holes. For those with unstretched or standard piercings, please order 20ga -- the 18ga will be difficult to insert and uncomfortable to wear. These open hoop style earrings are approximately 5/8 inch in diameter. 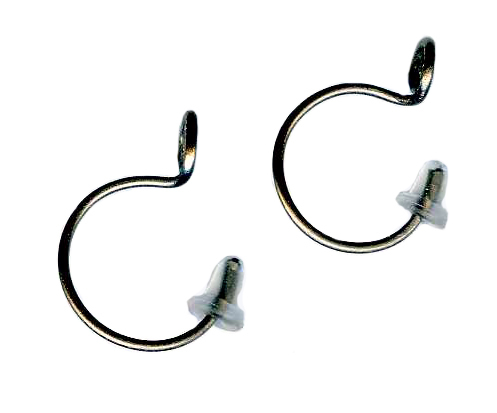 Unlike standard sleeper style hoops, which can be difficult to open and close, these earrings provide the hoop style without the hassle of opening and closing the hoop. All of these earrings include a pair of hypoallergenic rubber earwire guards to prevent loss of the earrings. 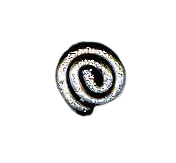 These earrings can be worn with the 5mm spiral disc in the front or at back of the earlobe. Handcrafted in USA from Grade 1 titanium wire -- the highest and purest grade of titanium available. These are a special order item, handcrafted upon request and usually ship 2 days after order is placed.